The Information We Collect: We collect information directly from individuals, from third parties, and automatically through the SongDoor website. Account and Profile Information: We do not have log-in accounts; only a mailing-list signup form. If you enter SongDoor, we collect your name, contact information, and other information you provide, such as song titles and songwriter names. This information is not made public unless you win a Category or are the Grand Award winner, and then only your name, a photo (requested with permission) co-writer name(s), the .mp3 music file and the song title appear on our website and in any press release announcing the winners. We keep this information for 1cing profile will be available for viewing to users of the SongDoor website. Once you create a profile, other users will be able to see in your profile certain information about your activity on the SongDoor website, such as the questions and answers you post, your followers and who you follow, topics of interest to you, the information you list as credentials, and your edits to Your Content. For more information about your choices for publicly displayed information, see the section below about Your Choices. Uploaded Files: SongDoor claims no ownership rights in the text files or musical works (collectively, "User Uploads") that you directly upload to the Website. After uploading your content to the Website, you will continue to retain all ownership rights to that content. By uploading your content to the Website, you hereby grant to SongDoor a limited license to use and publicly air the content in the event that you are a Grand Award or Category winner, and only in that instance. By uploading your content, you represent and warrant that: a) you own the content uploaded by you to the Website and b) the publishing of your content on the Website does not violate the privacy rights, publicity rights, copyrights, contract rights or any other rights of any person. You agree to pay for all royalties, fees, and any other monies owing any person by reason of any Content published by you to or through the Website. Your Content:· Website visitors do not have a place to post public content on SongDoor’s website, so there is no consent necessary. Communications.·When you communicate with us (via email, phone, through the SongDoor website, or otherwise), we may maintain a record of your communication. Integrated Service Provider and Linked Networks: There are no login accounts available to SongDoor website visitors or the ability/opportunity to sign in with a linked network such as Facebook or Google. If you enter a song in the competition, an entry fee is required which is paid via PayPal on their website. We do not have access to any entrants’ credit card information; that is all stored on PayPal. SongDoor only has a record of the entrant’s name, address, payment amount and date of payment. Engagement: We do not collect browsing information such as IP address and location, date and time stamp, user agent, cookie ID , unique advertising or content identifiers and time zone, and other information about user activities on the SongDoor website, as well as on third party sites and services. We do not employ ads and do not collect any information connected with clicks or opens. We receive information about you from our credit card processor, PayPal, but not your payment method or details. ·	Provide Services. To provide you the services we offer on the SongDoor website, communicate with you about your use of the SongDoor website, respond to your inquiries, provide troubleshooting, and for other customer service purposes. ·	Personalization. To tailor the content and information that we may send or display to you in the SongDoor website. ·	Advertising. We do not advertise. ·	Marketing and Promotions. For marketing and promotional purposes, such as to send you news and newsletters, special offers, and promotions, or to otherwise contact you about products or information we think may interest you, including information about third party products and services. ·	Analytics. To gather metrics to better understand how users access and use the SongDoor website; to evaluate and improve the SongDoor website. ·	Comply with Law. To comply with legal obligations, as part of our general business operations, and for other business administration purposes. Service Providers: We may share your information with third-party service providers who use this information to perform services for us, such as payment processors, hosting providers or auditors, customer service and support providers. Business Transfers: We may disclose or transfer information, including personal information, as part of any merger, sale, and transfer of our assets, acquisition or restructuring of all or part of our business, bankruptcy, or similar event. Legally Required: We may disclose your information if we are required to do so by law. Protection of Rights: We may disclose information where we believe it necessary to respond to claims asserted against us or, comply with legal process (e.g., subpoenas or warrants), enforce or administer our agreements and terms, for fraud prevention, risk assessment, investigation, and protect the rights, property or safety of SongDoor, its users, or others. Your Content and Activity: There is no user-posted Content on the SongDoor website. Metrics. We do not share metrics information with any other parties. No personal information is collected as part of the SongDoor website metrics, which include unique visits, page views and other anonymous information, like time/date of website visit. Anonymized and Aggregated Data.·We may share aggregated or de-identified information with third parties for research, marketing, analytics and other purposes, provided such information does not identify a particular individual. ·	Cookies. These are small files with a unique identifier that are transferred to your browser through our websites. They allow us to track the number of visitors and the pages they visit. We do not track logins because we do not offer login accounts. ·	Pixels, web beacons, clear GIFs. We do not employ pixel tags, web beacons or clear GIFs for tracking. ·	Analytics Tools. We may use internal and third party analytics tools, including StatCounter. The third party analytics companies we work with may combine the information collected with other information they have independently collected from other websites and/or other online products and services. Their collection and use of information is subject to their own privacy policies. Do-Not-Track Signals: Please note we do not change system behavior within the SongDoor website in response to browser requests not to be tracked as we carry no ads, do not use pixel tags nor have login accounts. SongDoor Ads and Personalization: We do not advertise on th SongDoor website so no information is collected about user engagement. No tracking opt-out is necessary because there is nothing to opt out of. How We Protect Your Information: The security of your information is important to us. SongDoor has implemented safeguards to protect the information we collect. However, no website or Internet transmission is completely secure. Ther is no need to log out of the SongDoor website because we do not supply login accounts. Access and Amend Your Information: We do not have user accounts so there is nothing to login and change or. Anonymous Posts: We do not have posting capability on the SongDoor website. Your Content: We do not have posting capability on the SongDoor website so there is no content to post, edit or delete. Adult Content: There is no adult content on the SongDoor website. 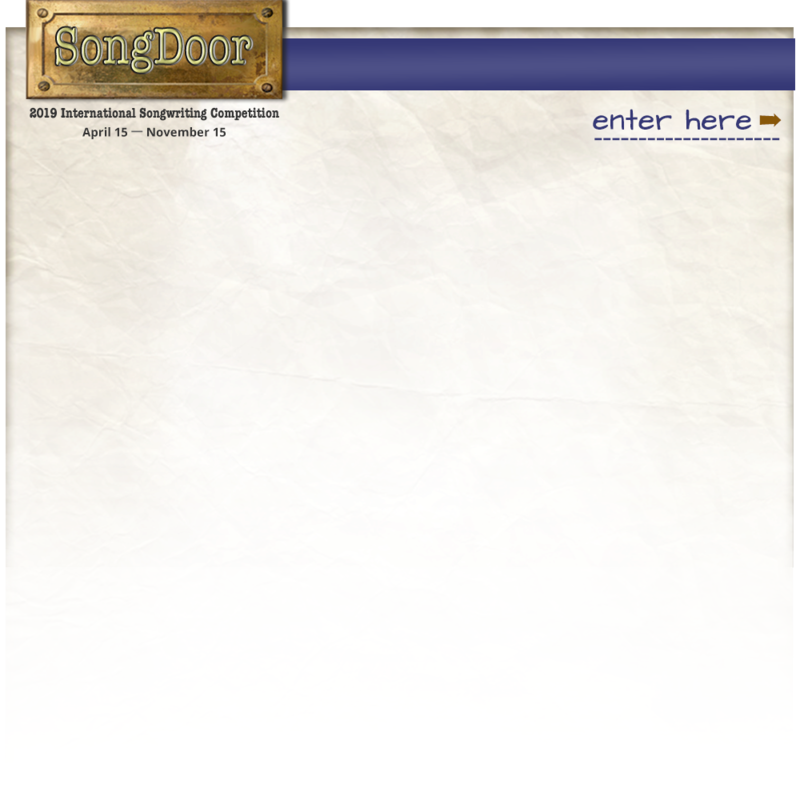 Emails and Communications: If you join the SongDoor mailing list, you will receive the infrequent emails about competition deadlines, winners’ announcements or a third-product product discount. You may opt out of these emails by clicking the link at the bottom of each/any communication. If you opt out, we may still send you emails notifying you about winning a Category or the Grand Award, or we may respond to a question that you initiate. Followers: We do not provide this option on the SongDoor website. Indexed Search: We do not have user accounts that can be indexed by search engines. Deleted or Deactivated Account: We do not offer accounts, so deleting or deactivating an account is not possible. Mailing list subscribers may opt out of future emails by clicking on the appropriate link at the bottom of each communication. Pixels: We do not use pixel tags. Third Party Ad Networks: We do not employ outside advertising of any kind on the SongDoor website. If a visitor chooses to click on a logo link to one of our sponsors, they may do so, but will leave the SongDoor site. Linked Networks: We do not provide login accounts that may be enabled by linked networks such as Facebook or Google. SongDoor is headquartered in the United States, and has operations, entities and service providers in the United States and throughout the world. As such, we and our service providers may transfer your personal information to, or access it in, jurisdictions (including the United States) that may not provide equivalent levels of data protection as your home jurisdiction. We will take steps to ensure that your personal information receives an adequate level of protection in the jurisdictions in which we process it. Children’s Privacy: We do not knowingly collect or solicit personal information from anyone under the age of 16 or knowingly allow such persons to register. If we become aware that we have collected personal information from a child under the relevant age without parental consent, we take steps to delete that information. Your California Privacy Rights: California law permits users who are California residents to request and obtain from us once a year, free of charge, a list of the third parties to whom we have disclosed their personal information (if any) for their direct marketing purposes in the prior calendar year, as well as the types of personal information disclosed to those parties. We do not disclose any personal information to third parties.